For other people named Tony Tan, see Tony Tan (disambiguation). Tony Tan Keng Yam DUT (First Class) (born February 7, 1940) is a Singaporean politician who was the seventh President of Singapore & Commander-in-Chief of Singapore Armed Forces, holding office from 2011 to 2017 after winning the Singaporean presidential election, 2011. Formerly a member of the country's governing People's Action Party (PAP), he was the Minister for Finance, Minister for Defence, Minister for Education, Coordinating Minister for Security and Defence and Deputy Prime Minister of Singapore. He was a Member of Parliament (MP) representing Sembawang GRC between 1988 and 2006 and Sembawang SMC between 1979 and 1988. He is the only living former president of Singapore. He received 35.20% of the votes, winning by a narrow 0.34% margin over Tan Cheng Bock. Tan was sworn in as President on 1 September 2011 and held office until 31 August 2017. In 1969, Tan left the University of Singapore to begin a career in banking with Overseas-Chinese Banking Corporation (OCBC), where he rose to become General Manager, before leaving the bank to pursue a career in politics in 1979. A member of the People's Action Party (PAP) until June 2011, Tan became a Member of Parliament (MP) in 1979. He was appointed as a Senior Minister of State in the Ministry of Education in 1979. He joined the Cabinet in 1980, serving as Minister for Education (MOE). As the Minister for Education, Tan scrapped a policy that favoured children of more well-educated mothers ahead of children of less-educated mothers in primary school placement in response to popular discontent and public criticism of the policy which saw PAP receiving the lowest votes since independence during the 1984 general election. He also introduced the independent schools system, allowing established educational institutions in Singapore to charge its own fees and have control over their governance and teaching staff, though this was criticised by parents as being "elitist" and made top-ranked schools increasingly out of reach to poorer families due to subsequent fee hikes. Tan took on the role of Minister for Trade & Industry from 1981 to 1986. He was also appointed Minister for Finance (1983–85), and Minister for Health (1985–86). Tan espoused a cut in the Central Provident Fund (CPF) in the 1980s, which Prime Minister Lee Kuan Yew had said would not be allowed except "in an economic crisis". Tan was also known to have opposed the shipping industry strike in January 1986, the first for about a decade in Singapore, which was sanctioned by fellow cabinet member Ong Teng Cheong, the secretary-general of the National Trades Union Congress (NTUC), who felt the strike was necessary. As Minister for Trade and Industry, Tan was concerned about investors' reactions to a perceived deterioration of labour relations and the impact on foreign direct investment. Although striking was prohibited and trade unions were barred from negotiating such matters as promotion, transfer, employment, dismissal, retrenchment, and reinstatement, issues that "accounted for most earlier labour disputes", the government provided measures for workers' safety and welfare, and serious union disputes with employers were almost always handled through the Industrial Arbitration Court, which had powers of both binding arbitration and voluntary mediation. However, Ong felt these measures did not prevent "management [from] taking advantage of the workers", recalling in a 2000 interview in Asiaweek: "Some of them were angry with me about that... the minister for trade and industry [Tan] was very angry, his officers were upset. They had calls from America, asking what happened to Singapore?" However the fact that the strike only lasted two days before "all the issues were settled" was cited by Ong in a 2000 interview with Asiaweek as proof that "management was just trying to pull a fast one". Separately, Tan initially opposed the timing of building the Mass Rapid Transit in 1981 when it was raised by Ong. Tan held the view that the local construction industry was overheated at the time, and public housing should take priority. In December 1991, Tan stepped down from the Cabinet to return to the private sector, and rejoined the Oversea-Chinese Banking Corporation (OCBC) as the Chairman and Chief Executive Officer from 1992 to 1995, while retaining his seat in Parliament as a representative for the Sembawang Group Representation Constituency. After Ong Teng Cheong and Lee Hsien Loong were diagnosed with cancer in 1992, and 1993 Tan was asked to return to Cabinet in August 1995 as Deputy Prime Minister (1995–2005) and Minister for Defence (1995–2003). It was reported that he declined an offer of make-up pay, which compensated ministers for a loss in salary when they leave the private sector. Tan declared that "the interests of Singapore must take precedence over that of a bank and my own personal considerations". In August 2003, he relinquished the defence portfolio and became the Co-ordinating Minister for Security and Defence, while retaining the post of Deputy Prime Minister. He later persuaded the Minister for National Development Mah Bow Tan to abandon plans to demolish an old mosque in his constituency of Sembawang. Dubbed the "Last Kampung Mosque in Singapore", it was later designated a heritage site. Tan joined other dissenting colleagues in opposing the implementation of "integrated resorts" with their attached casinos to Singapore. Commenting on an MCYS survey of gambling habits, Tan had said he was "appalled" that a newspaper headline dismissed the number of likely problem gamblers (55,000) as insignificant: "I don't think it's insignificant. Every Singaporean is important. Every Singaporean that gets into trouble means one family that is destroyed. It cannot be a matter of small concern to the Government." Tan stepped down as Deputy Prime Minister and Co-ordinating Minister for Security and Defence on 1 September 2005. Tan was appointed the Executive Director of the Government of Singapore Investment Corporation (GIC) following his retirement from Cabinet in 2005. Tan's tenure at the GIC coincided with moves towards "greater disclosure in the investment fund's activities amid mounting concerns about the secretive fund's influence after high-profile investments in UBS and Citigroup." In September 2008 GIC issued the first of a series of annual reports on GIC's portfolio management, governance, and people. In 2008 during the global financial crisis, GIC experienced a significant drop in its real rate of return which recovered subsequently. On 22 December 2010, Tan announced that he would step down from his government-linked positions at GIC and SPH to run for the office of President of Singapore. Tan's campaign stressed his independence and his divergent views from the PAP government in specific policies, citing a remark made by East Coast GRC MP Tan Soo Khoon in 2005: "It is probably the first time that I have heard Cabinet Ministers, starting with no less than the Deputy Prime Minister, Dr Tony Tan, expressing divergent views [on the Integrated Resorts question]." However, competing presidential election candidates and former PAP members Tan Kin Lian and Tan Cheng Bock questioned Tan's independence from the party. On 7 July 2011, Tony Tan submitted his presidential eligibility forms. On 29 July 2011, Tan responded to online allegations that his son Patrick Tan had received preferential treatment during compulsory military service, officially known as National Service (NS) in Singapore. "My sons all completed their National Service obligations fully and I have never intervened in their postings," he said. Tan also noted that he had served as Defence Minister from 1995 to 2003, while Patrick Tan said that it was in 1988 that he been permitted by Singapore's Ministry of Defence (MINDEF) to disrupt his NS for premedical studies in Harvard University and an MD-PhD program in Stanford University under a President's Scholarship and Loke Cheng Kim Scholarship. MINDEF clarified that, prior to 1992, disruptions were allowed for overseas medical studies, and longer periods of disruption were granted for those admitted to universities in the United States, where medicine is a graduate course. American medical students are required to complete a "pre-medical component for a general undergraduate degree" before applying to medical school. In response to a question in Parliament on the subject of deferments, Minister for Defence Ng Eng Hen stated on 20 October 2011 that Patrick Tan had not been given any special treatment. Describing himself as "Tested, Trusted, True", Tan said his past experiences will help him steer Singapore through the financial uncertainty lying ahead. On Nomination Day (17 August 2011), Tan unveiled his election symbol – a pair of black glasses which resembles the trademark spectacles he has steadfastly worn for years. His campaign materials, which included caps, postcards and fridge magnets also carried the symbol. About 9,400 posters and 200 banners were printed. Tan's presidential bid was endorsed by the 10,000-strong Federation of Tan Clan Associations on 7 August 2011. By 13 August 2011, the leaders of 19 NTUC-affiliated unions (which have 128,000 members) had endorsed his bid. On 14 August, the leadership of the Singapore Federation of Chinese Clan Associations (SFCCA) and the Singapore Chinese Chamber of Commerce & Industry (SCCCI) also endorsed his bid. The leadership of another four unions from the construction and real estate sector, which represent more than 50,000 members, endorsed Tan's bid on 16 August. Nine Teochew clan associations also supported Tan. Union leaders in three sectors – Transport and Logistics, Marine and Machinery-engineering, and Infocomm and Media – endorsed Tan on 17 August. They together represent 112,000 workers. Tan received The Singapore Malay Chamber of Commerce and Industry (SMCCI) endorsed Tan's presidential candidacy on 18 August 2011. It is also was the first Malay organisation to do so. After a closed door meeting with the Singapore Malay Chamber of Commerce and Industry on 11 August 2011, Tan remarked that it is "not too early" for the government to have contingency plans in case an economic crisis hits Singapore, noting that "with his background and knowledge", he added that he was in a position to provide "a steady hand". Speaking to reporters after a dialogue with the Singapore Manufacturers' Federation the following day, Tan remarked that it would be a "grave mistake" to phase out manufacturing in Singapore, which has been transitioning to a service economy and an information economy since the 1980s. He then went on to describe manufacturing as a "key pillar of Singapore's economy". Without the sector, he feels Singapore's economy will be "less resilient, less diversified" and there will be "fewer options for our young people and Singapore will lose." On 15 August 2011, following the National Day Rally speech by Prime Minister Lee Hsien Loong, Tan said that one point he found particularly interesting in Lee's address was whether Singapore would remain pragmatic in its policy making, or if it would turn populist. He added that the temptation to make populist decisions was affecting the presidential election, "with some candidates appealing to the public in ways that could go beyond the parameters of the Singapore's Constitution". On 17 August 2011, crowds booed at Tan and his son as he delivered his two-minute Nomination Day speech. According to The Straits Times, the jeers came from a vocal group of people who mostly supported another presidential candidate Tan Jee Say. At a press conference later that day, Tony Tan said that while different points of view were to be expected in a campaign, it was disappointing to have people who would not even listen, and hoped that Singaporeans would listen to the views of all the candidates. He said, "I don't think that jeering or heckling is the right way to go about the campaign, particularly in a campaign for the president, which has to be conducted with decorum and dignity." On the first presidential candidate broadcast on 18 August 2011, while other candidates made promises in their first presidential candidate broadcasts on Thursday night, Tan refrained from making promises during the broadcast and focused on the role of the President instead. Speaking in English, Chinese and Malay, Tan said, "Some people argue that the President must take a public stand on current issues. I hear and share the concerns of Singaporeans. But policies are debated in Parliament and implemented by the Government. Others have said that the President must oppose the Government. That is a job for the Opposition. People interested in such roles should run for Parliament in the next General Election." Tan sought to distinguish his presidency by promoting a more active civil society, believing that Singapore needed to build up its "social reserves" to complement the substantial financial reserves the city state had accumulated over time. An example of this, he said, was the way that he had expanded Singapore's President's Challenge charity event to go beyond fund-raising to promote volunteerism and social entrepreneurship. On 8 November 2016, Tan announced that he would not be standing in 2017 presidential election, which was reserved for Malay candidates after a constituitional amendment on 9 November 2016. Tan left office on 31 August 2017. He was succeeded by Halimah Yacob who became President after a walkover of the presidential elections, as no other candidates were deemed eligible. From 1980 to 1981, Tan was the first Vice-Chancellor of the National University of Singapore (NUS). After his retirement from the Cabinet in 2005, Tan became the chairman of the National Research Foundation and deputy chairman of the Research, Innovation and Enterprise Council. He was also Chairman of Singapore Press Holdings Limited (SPH). Tan has served as patron of many organisations, including the Singapore Dance Theatre, the Singapore Computer Society, SJI International, the Duke-NUS Medical School, and the MIT Club of Singapore. Most recently, in May 2011, he was named as the first patron of Dover Park Hospice. On 21 November 2017, GIC Private Limited, one of Singapore's sovereign wealth funds, announced that Tan was to be appointed director and special advisor from 1 January 2018. Tan's grandfather is Tan Cheng Siong, the former general manager of The Oversea Chinese Bank. His uncle was former OCBC chairman Tan Chin Tuan. Tony Tan married Mary Chee Bee Kiang in 1964. They have four children: three sons and one daughter. In 2005, Tan was presented the NUS Eminent Alumni Award in recognition of his role as a visionary architect of Singapore's university sector. In 2010, he was presented the inaugural Distinguished Australian Alumnus Award by the Australian Alumni Singapore (AAS) at its 55th anniversary dinner in recognition of his distinguished career, and his significant contribution to society and to the Australian alumni community. Tan was awarded a medal from the Foreign Policy Association in 2011 for "outstanding leadership and service". In 2014, Tan was conferred an honorary doctorate by his Alma mater University of Adelaide for his "long record of outstanding achievements both as a leader in the Singapore government and in the business sectors. In 2018, Tan received the top honour of the Order of Temasek (First Class) during Singapore's National Day Awards. ^ "Tony Tan elected as Singapore's 7th President". Hindustan Times. India. Retrieved 28 August 2011. ^ a b c d e "Dr Tony TAN Keng Yam". National University of Singapore. Archived from the original on 13 June 2011. Retrieved 21 June 2011. ^ "SPH Annual Report, 2009" (PDF). Archived from the original (PDF) on 13 June 2012. Retrieved 28 August 2011. ^ John W. Langford and K. Lorne Brownsey, The Changing Shape of Government in the Asia-Pacific Region (IRRP, 1988), p. 136. ^ Quah, Jon (1985). "Singapore in 1984: Leadership Transition in an Election Year". Asian Survey. 25 (2): 225. doi:10.1525/as.1985.25.2.01p0247v. JSTOR 2644306. ^ Matthews, Roger (13 November 1987). "Survey of Singapore (11): Schools try independence – The latest education experiment". Financial Times. Factiva. ^ Sai Siong, Tan (3 December 1989). "There is hope outside of independent schools". Straits Times. Factiva. ^ Kernial Singh Sandhu and Paul Wheatley, Management of Success: The Moulding of Modern Singapore (Institute of Southeast Asian Studies, 1989), pp. 69. ^ Barr, Michael D (2000). "Trade Unions in an Elitist Society: The Singapore Story". Australian Journal of Politics and History. 46 (4): 480–496. doi:10.1111/1467-8497.00109. ^ "Labor – Singapore". Library of Congress Country Studies. Library of Congress. Retrieved 18 August 2011. ^ "'I Had a Job to Do' Whether the government liked it or not, says ex-president Ong". Asiaweek. Archived from the original on 11 February 2011. Retrieved 17 August 2011. ^ Wong, Mai Yuan (17 December 1981). "Foolish to build MRT now: Tony Tan". Straits Times. ^ "Ong Teng Cheong". Infopedia.nl.sg. Archived from the original on 21 August 2011. Retrieved 28 August 2011. ^ "It was a bolt from the blue. But that's life". Ourstory.asia1.com.sg. 9 May 1993. Archived from the original on 19 May 2007. Retrieved 28 August 2011. ^ "Singapore | Profile of Dr Tony Tan". TODAYonline. Archived from the original on 8 August 2011. Retrieved 28 August 2011. ^ Chua Mui Hoong, "Tony Tan to rejoin Govt", Straits Times, 29 June 1995. ^ "I would have preferred to continue working at the bank", Straits Times, 30 June 1995. ^ "Saved for a Year, Village Mosque May Be Made National Heritage" (PDF). Straits Times. 15 November 2004. Retrieved 30 August 2011. ^ ""Sembawang Beyond the Slumber", The Long and Winding Road, 29 March 2011". Thelongnwindingroad.wordpress.com. 9 August 2011. Retrieved 28 August 2011. ^ Tan, Hui Leng (15 April 2005). "2% Risk 'Not Small'". Today. Retrieved 16 August 2011. ^ National Research Foundation (Singapore), Board Archived 24 December 2012 at Archive.today, GIC Board of Directors Archived 22 December 2010 at the Wayback Machine, SPH Annual Report, 2009 Archived 13 June 2012 at the Wayback Machine. ^ ""Singapore sovereign wealth fund promises greater transparency", Financial Times, 28 January 2008". Financial Times. 28 January 2008. Retrieved 28 August 2011. ^ "Report on the Management of the Government's Portfolio for the Year 2007/08 (September 2008)". Gic.com.sg. Archived from the original on 27 September 2011. Retrieved 28 August 2011. ^ Han, Chun (23 June 2011). ""GIC's Tan to Run for President of Singapore", Wall Street Journal Asia, 23 June 2011". The Wall Street Journal. Retrieved 28 August 2011. ^ "Singapore Parliamentary Hansard, 19 April 2005". 160.96.186.99. Archived from the original on 7 August 2011. Retrieved 28 August 2011. ^ "President must act independently: Dr Tony Tan". AsiaOne. 15 July 2011. Retrieved 10 August 2011. ^ Cheney, Satish (24 June 2011). "Singapore | Tan Cheng Bock and Tan Kin Lian question Tony Tan's independence". TODAYonline. Archived from the original on 8 August 2011. Retrieved 28 August 2011. ^ Han, WeiChou (7 July 2011). "Presidential hopefuls Tony Tan and Tan Kin Lian submit papers". Channel NewsAsia. Retrieved 7 July 2011. ^ "Some questions on Dr Patrick Tan's NS stint". ^ Tan, Tony. "Statement from Tony Tan – 29 July 2011". Facebook. Retrieved 13 August 2011. ^ Leong, Wee Keat (30 July 2011). "Tony Tan refutes allegations of preferential treatment for son". Today. Retrieved 11 August 2011. ^ "Patrick: Like father in some ways". Newspapers. Retrieved 28 August 2011. ^ Tan, Tony. "Statement by Patrick Tan – 29 July 2011". Facebook. Retrieved 29 July 2011. ^ Tan, Desmond (5 August 2011). "FORUM: Mindef: Disruption for medical course applied uniformly". Straits Times. Retrieved 21 August 2011. ^ "Reply by Minister for Defence to Parliamentary Question". MINDEF Singapore. Retrieved 12 February 2012. ^ "I'm tested, trusted, true: Tony Tan". TODAYonline. Archived from the original on 31 August 2011. Retrieved 28 August 2011. ^ "PE Tony Tan on what he wants to do if elected". Channel NewsAsia. 17 August 2011. Retrieved 28 August 2011. ^ Cai, Hongxiang (7 August 2011). "Tan federation endorses Tony Tan". Straits Times. ^ Chan, Joanne (11 August 2011). "PE: Trade unions endorse Dr Tony Tan for PE". Channel NewsAsia. ^ Ng, Jing Yng (13 August 2011). "12 more unions support Tony Tan". Today Online. Archived from the original on 14 June 2012. Retrieved 14 August 2011. ^ Tan, Dawn (13 August 2011). "2 Chinese networking groups endorse Tony Tan". Straits Times. Singapore. Retrieved 28 August 2011. ^ Loh, Dylan. "Singapore | SCCCI endorses Tony Tan". TODAYonline. Archived from the original on 14 June 2012. Retrieved 28 August 2011. ^ "PE: More unions, Teochew associations back Tony Tan's presidential bid". Channel NewsAsia, MSN. Retrieved 16 August 2011. ^ "PE More union clusters endorse Dr Tony Tan for Elected Presidency". Channel NewsAsia. 17 August 2011. Retrieved 28 August 2011. ^ "PE Malay chamber backs Tony Tan for President". Channel NewsAsia. 18 August 2011. Retrieved 28 August 2011. ^ "Dr Tony Tan, do you know why you were booed?". ^ Cai, Haoxiang (18 August 2011). "Tony Tan heckled; fellow candidates voice disapproval". Straits Times. Retrieved 19 August 2011. ^ RazorTV (18 August 2011). "Crowds boo during Dr Tony Tan's Nomination Day speech". Asiaone.com. Retrieved 28 August 2011. ^ Jing, Ng (20 August 2011). "Singapore | Tony Tan focuses on the President's role". TODAYonline. Archived from the original on 14 June 2012. Retrieved 28 August 2011. ^ Wee, Leong (19 August 2011). "Singapore | Proposals, promises as PE broadcasts begin". TODAYonline. Archived from the original on 14 June 2012. Retrieved 28 August 2011. ^ Goh Chin Lian, "President to Singaporeans: Expand people-to-people bonds", Straits Times, 6 November 2013. ^ Leong Wai Kit, "S’pore needs both financial and ‘social’ reserves to thrive: President Tony Tan", Today, 6 November 2013. ^ "President Tony Tan says he will not be standing in 2017 presidential election reserved for Malay candidates". The Straits Times. 8 November 2016. ^ "Parliament passes changes to elected presidency". The Straits Times. 10 November 2016. ^ "President Tony Tan leaves office today". The Straits Times. 31 August 2017. ^ Wong, Tessa (13 September 2017). "'Walkover' election troubles Singaporeans". BBC News. ^ "Singapore Dance Theatre". Singapore Dance Theatre. Archived from the original on 30 September 2011. Retrieved 28 August 2011. ^ "Singapore Computer Society". Scs.org.sg. Archived from the original on 11 September 2012. Retrieved 28 August 2011. ^ "SJI International". SJI International. Retrieved 28 August 2011. ^ "Duke-NUS Medical School, Address by Mrs Mavis Khoo, 22 July 2008" (PDF). Retrieved 28 August 2011. ^ "MIT Club of Singapore". Alumweb.mit.edu. Retrieved 28 August 2011. ^ "Channel NewsAsia, 26 May 2011". Channel NewsAsia. 26 May 2011. Retrieved 28 August 2011. ^ "Dr Tony Tan appointed director and special advisor of GIC". Channel NewsAsia. Archived from the original on 21 November 2017. Retrieved 21 November 2017. ^ Lee, Lynn (14 November 2005). "Tan Chin Tuan made OCBC a household name". The Straits Time. ^ "Tony Tan receives Aussie alumni award". Straits Times. Singapore. Archived from the original on 22 November 2011. ^ Australian Alumni Singapore (26 November 2010). "Dr Tony Tan First Recipient of Distinguished Australian Alumnus Award". Archived from the original on 30 November 2011. Retrieved 23 August 2011. ^ "Former President Tony Tan tops list of National Day Awards recipients". Cheryl Lin. Singapore: Channel News Asia. 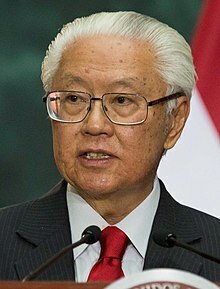 Wikimedia Commons has media related to Tony Tan Keng Yam. This page was last edited on 27 March 2019, at 13:02 (UTC).